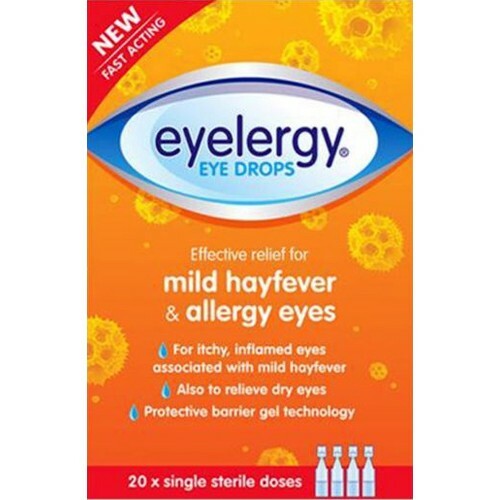 Eyelergy eye drops are sterile, preservative-free drops designed to work fast, for effective relief of itchy, infl amed and irritated eyes caused by dust or pollen (e.g. mild hayfever). Eyelergy eye drops help dilute and rinse dust and allergens from the eye and form a physical barrier on the surface of the eye to relieve and protect against irritation. The drops also relieve dry eyes caused, for example, by wearing contact lenses. 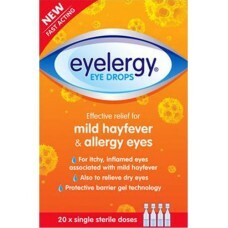 This pack contains 20 pre-filled plastic droppers each containing 0.4g of liquid eye drops. Please read the enclosed information leaet before use. Eyelergy eye drops are for use by adults, the elderly and children from 6 years of age, and are suitable for contact lens wearers. As often as required instill 1 or 2 drops into each eye and blink. Dab away excess fluid rinsed from the eye. Do not allow the tip of the dropper to touch any surface. Discard the dropper after use. Do not use if you are sensitive to any of the ingredients. Do not use if pre-filled single use plastic dropper is already opened or damaged, or after the expiry date. Although Eyelergy eye drops are not known to affect or be affected by other products used in the eyes, it is best to avoid using them at the same time as medicines in the eye unless recommended by a doctor. Your vision may become temporarily blurred after inserting eye drops. This will clear but do not drive or operate machinery until normal vision is restored. For use in the eyes only. Do not use after the expiry date shown on this carton. Ingredients have been used safely for many years, but safety trials have not been conducted. Adults, elderly and children from 6 years of age.